Hello Dear Readers . . . it’s a great day today as it is Floral Friday! for your very own. If you are stopping in for a visit from Lidy, Pam or Mary . . . Please visit my friends below and see their amazing creations. Just click on the link below their beautiful images located at the bottom of the post. 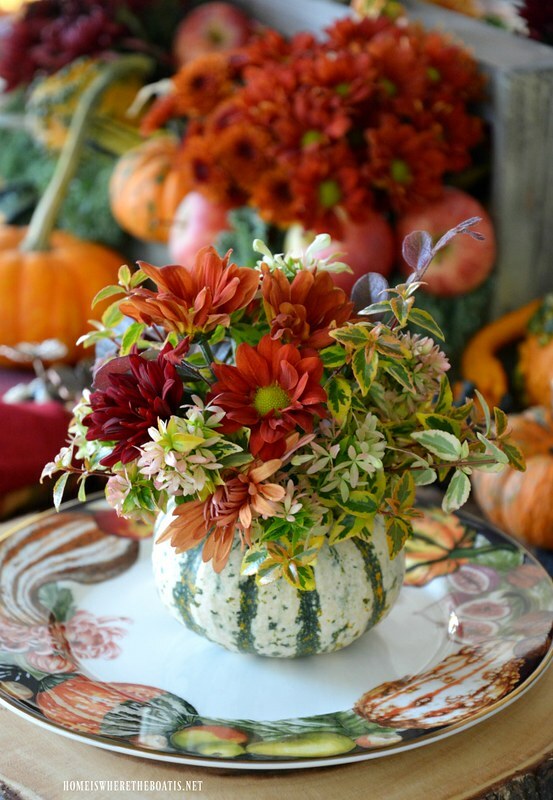 Today’s Floral Friday is all about flowers and pumpkins. 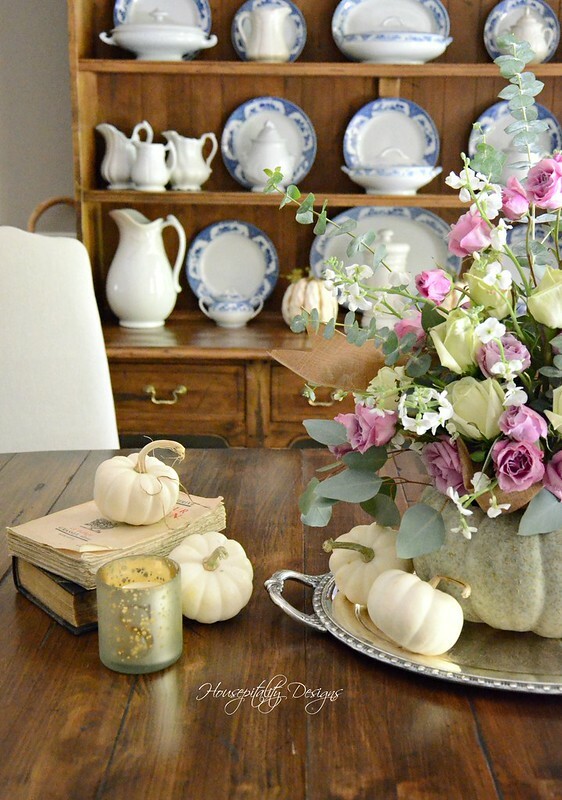 Welcome to my Cinderella Pumpkin Centerpiece – Floral Friday. I have found myself drawn to the softer shades of Fall. use lighter shades these days. I love Cinderella pumpkins of all sizes, shapes and colors. Hmmmm … is that why I like them so much? and inserted an Ikea metal flower pot with floral foam. I usually start with my filler (greenery and such) first. 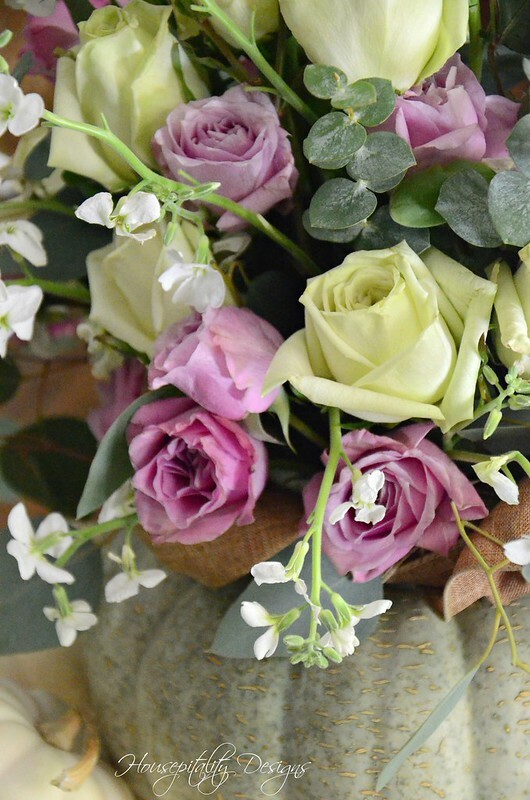 I started with the larger flower in the arrangement, the pretty soft green roses. I chose pink spray roses for my splash of color. however, I am a color gal and chose the deeper pink. 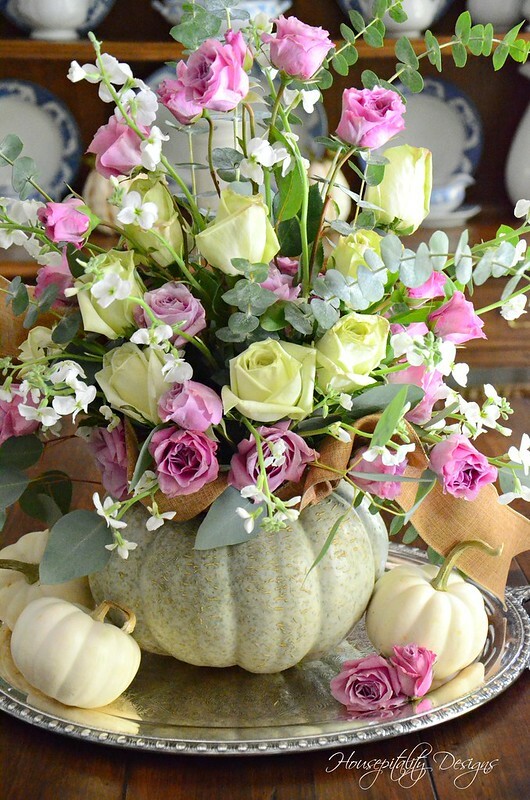 White Stock flowers add such a delicate and wispy appearance to the arrangement. 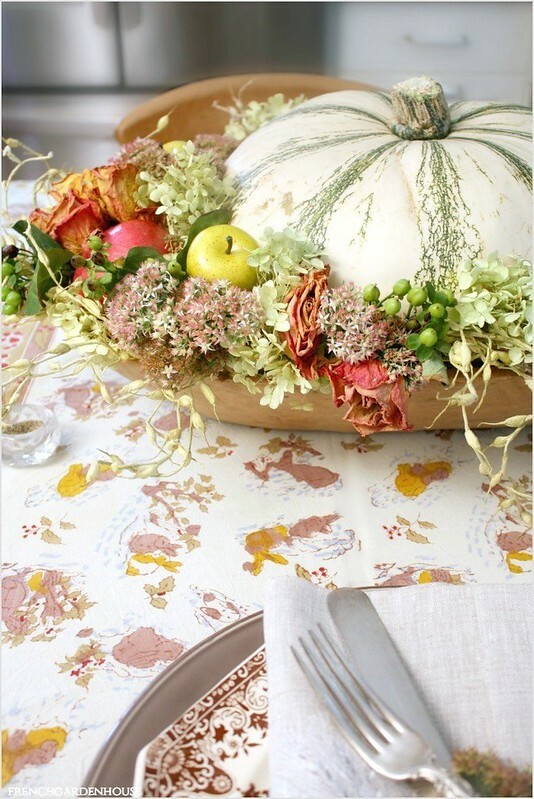 and also placed to where they are cascading down the centerpiece for a beautiful effect. They also have a very pretty scent. Charles Perrault’s classic French fairy tale. deserved to be displayed on a pretty silver tray. 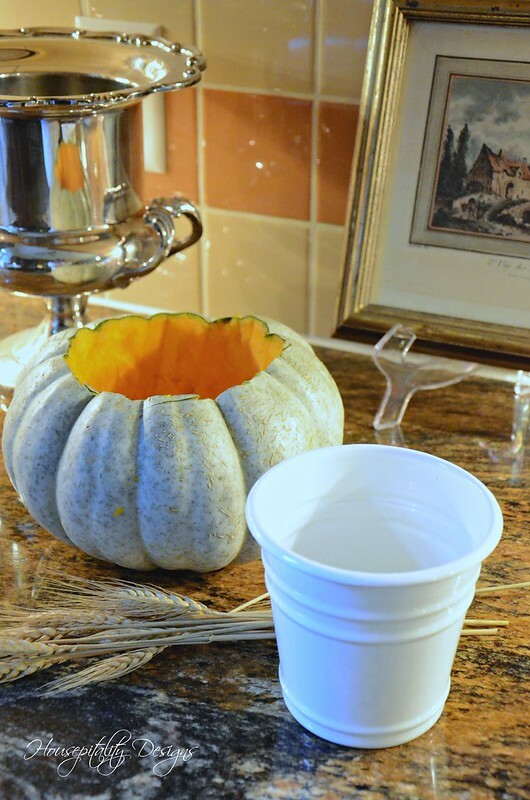 The top portion of the white flower pot was showing above the opening of the pumpkin. the surprise element of the ribbon to my floral creations. 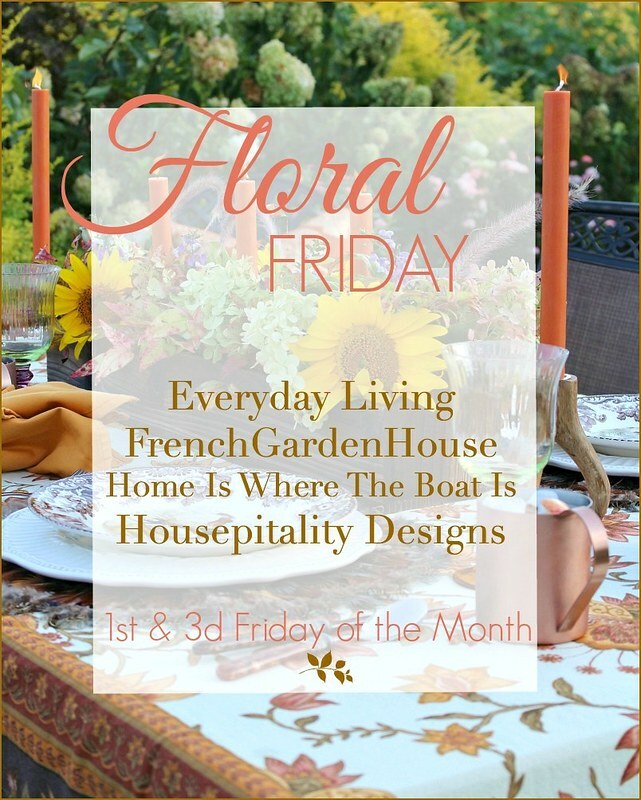 to visit my dear sweet friends of Floral Friday. As stated previously, the links to their post are below each of their beautiful images. Weren’t they just amazing?!!! … Yes they were! to one of my readers…for details go to my giveaway post HERE. 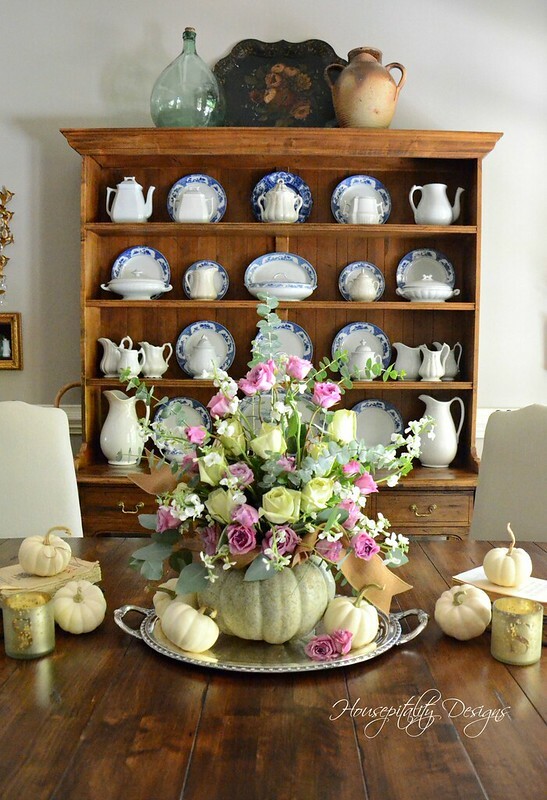 A very pretty arrangement and vignette, Shirley! I love the Cinderella pumpkin also for the fall season. 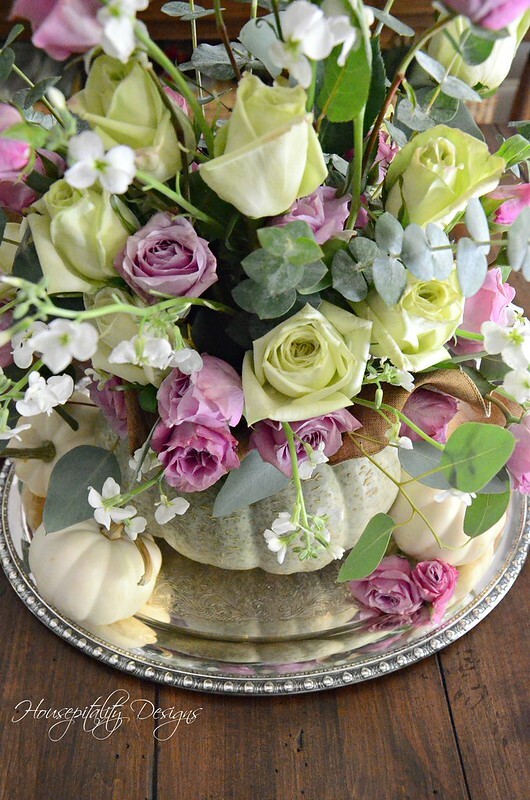 Love the height you gave your arrangement and your use of the silver elevates it that much more. Very pretty! Isn’t it amazing how you are so much more aware of the lack of light in your Berry Patch? You sure compensate well for it with your style touches. Have a great weekend. 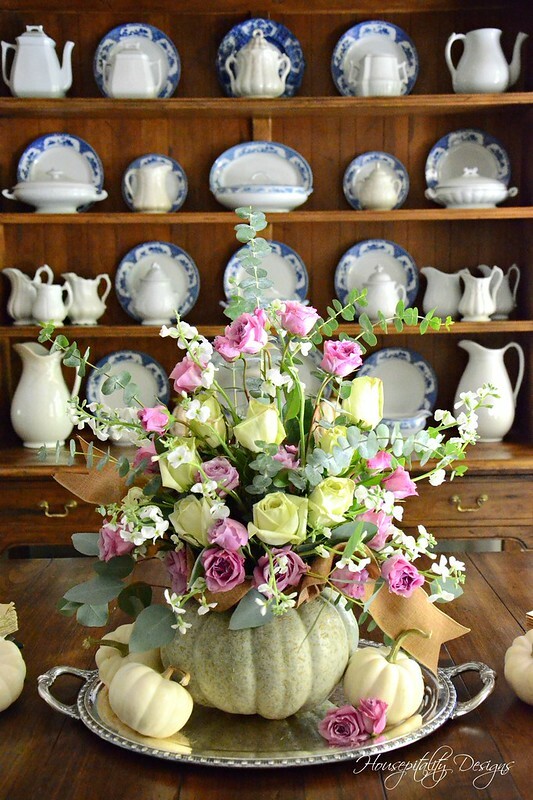 Love the Cinderella pumpkin Shirley and the pretty roses are just gorgeous. Happy Friday. It’s beautiful, Shirley and I love it on the silver tray. Happy weekend, my friend! Your beautiful ribbon added around your pumpkin was very creative. I enjoyed the could be story about the Cinderella pumpkin inspiring the fairy tale. I love the addition of stock to your arrangement. It does have a lovely scent. 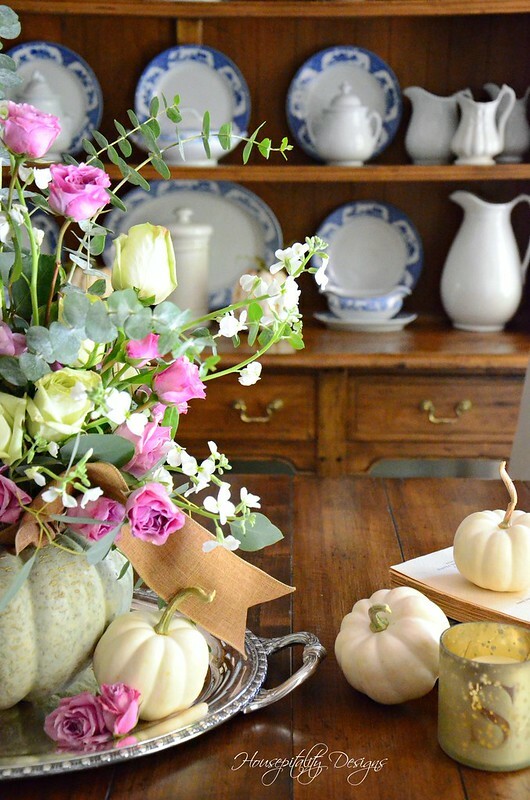 Oh, to have access to buy eucalyptus, stock, and even heirloom pumpkins without driving a distance would be glorious. I always enjoy your creativity, Shirley. This is so elegant and inspiring. Beautiful Shirley, I have been drawn to the softer side of fall for most of my adult life as I spoke about in my recent post. For some reason that’s what I enjoy. Now trees, the brighter the better. Beautiful Shirley. I love the softer side and the roses are breathtaking. Cinderella story for sure! Love this! Ooh I do love this. The Cinderella pumpkins are a favorite of mine too. 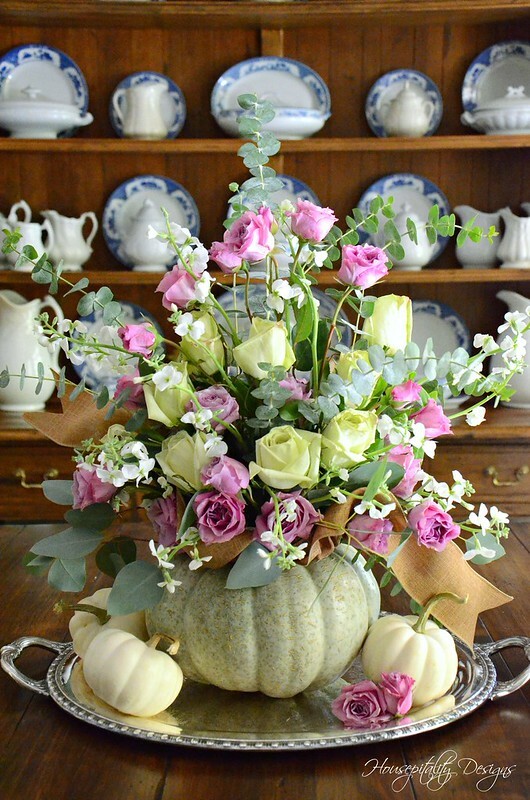 The flowers are so pretty and go nicely with the color of the pumpkin and I like the height you created with it. 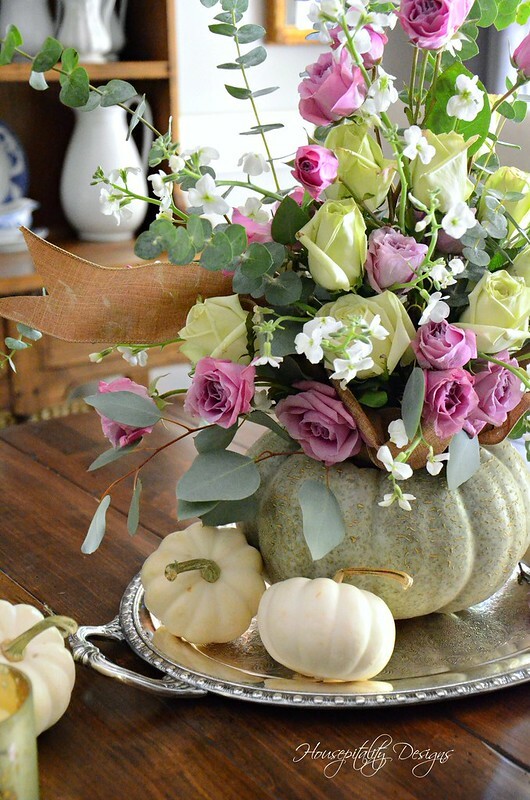 Another beautiful Floral Friday arrangement! Shirley, your designs are always so elegant and this one is stunning. 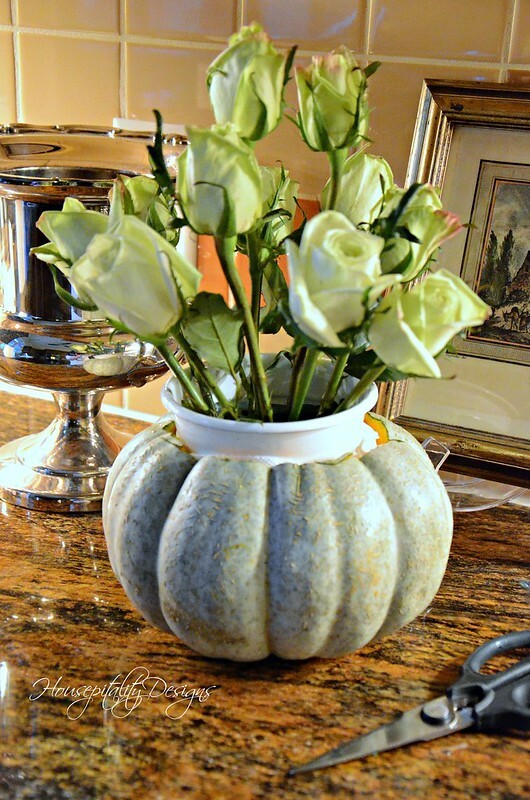 Cinderella pumpkins are so pretty and with your flowers tucked inside, it is Cinderella style for sure. I love the soft shades that you selected with the stock and eucalyptus and then the pretty pink spray roses stand out so well! I always enjoy seeing this beautiful hutch as your background. Your taste is impeccable dear friend and I love that I share Floral Friday’s with you! Shirley, so very pretty and love the arrangement on the silver tray. Oh, you are so good at creating these beauties. I need to learn how to do arrangements like these. Now, to find some time to practice! 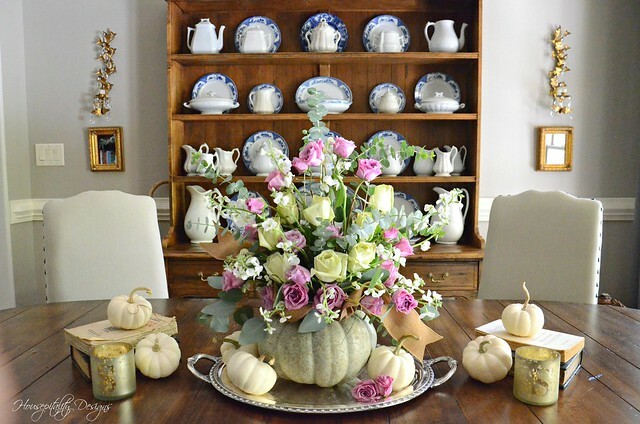 Shirley, your Cinderella pumpkin floral centerpiece is gorgeous, and placing it upon a silver tray is the perfect touch! 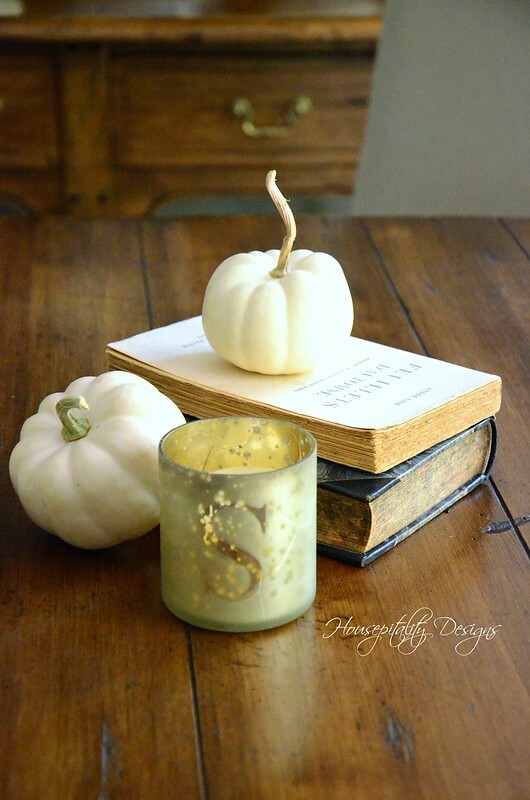 The French books, candles and pumpkins add a beautiful element to your display. I hope that you have a wonderful weekend!!! Shirley, you ever Cinderella pumpkin is beautiful and such a nice change from the usual fall colors! Have a happy weekend! Simply beautiful Shirley! 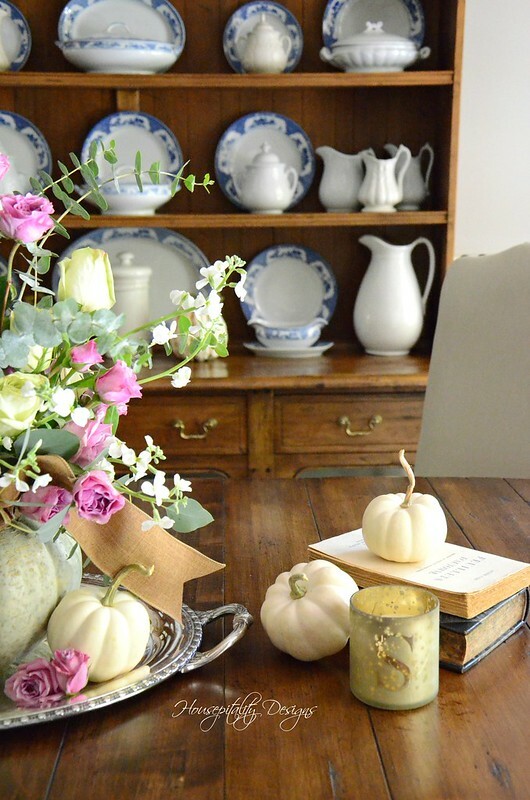 I love love the soft color palette, and the neutral pumpkins, just lovely! It looks beautiful on your silver tray too, wonderful touch! 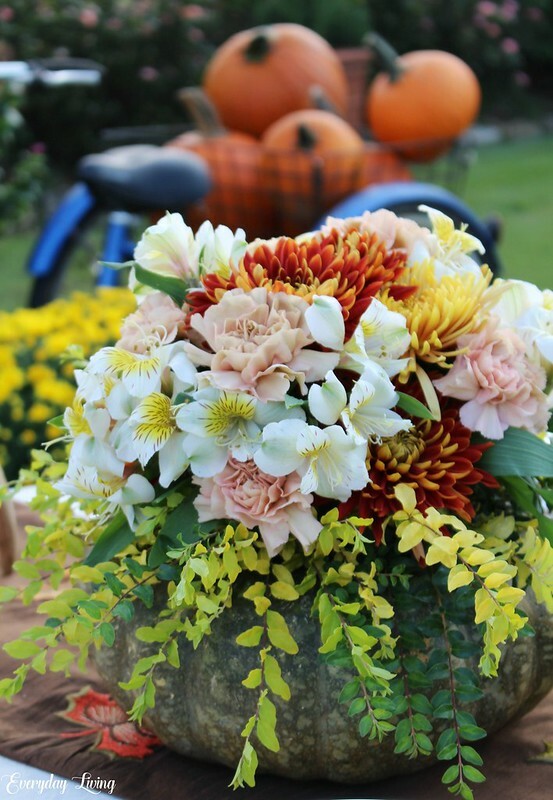 Shirley, I mean this with complete sincerity…you are one of the most talented floral arrangers I’ve ever seen. And Cinderella pumpkins are absolutely my favorite kind! Insanely pretty!!!!!! Oh, wow! 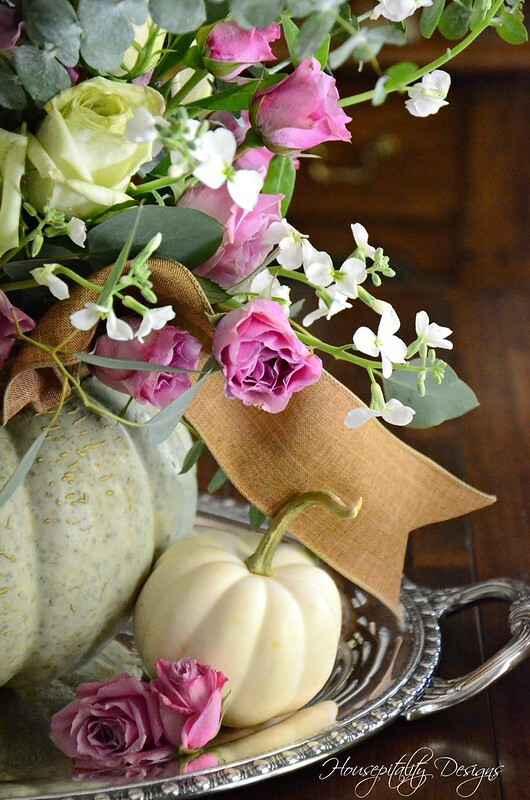 I like visiting the softer side of the season! Beautiful book, thank you a chance t win it. Would love it to add to my collection. Wow, stunning! My kind of fall decor. Love it!